* LOVELY FULL KITCHEN COMPLETE WITH EVERYTHING YOU NEED TO COMPLETE YOUR ADVENTURE. * DINING AREA FOR 4 - CROCKERY, CUTLERY & GLASSES PROVIDED FOR YOU TO EAT IN STYLE. 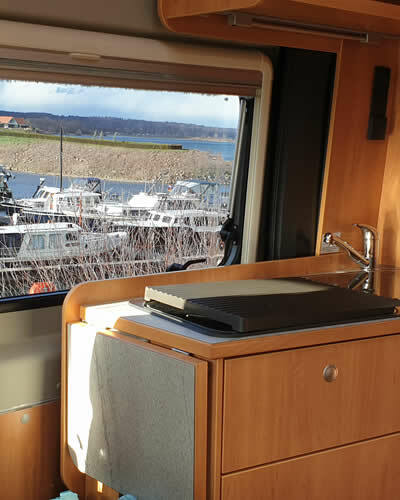 * WITH COMFORT AND STORAGE SPACE SHE WILL OFFER ALL YOUR HOLIDAY DESIRES. 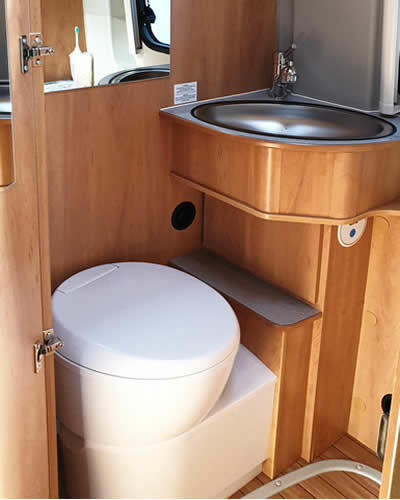 * ERGONOMIC BATHROOM WITH SHOWER, TOILET & BASIN. ALL BASIC TOILETRIES PROVIDED. * BEDROOM WITH EITHER A FIXED BED OR DISMANTLED FOR EXTRA STORAGE. * AN EXTRA BED CAN BE ASSEMBLED FOR CHILDREN, GRANDCHILDREN OR A GUEST. * MORE SPACIOUS THAN Daisie, RUBY OFFERS EXCELLENT LEVELS OF COMFORT. * EURO 6 130 bhp ENGINE ENSURES RUBY’S GREEN CREDENTIALS. 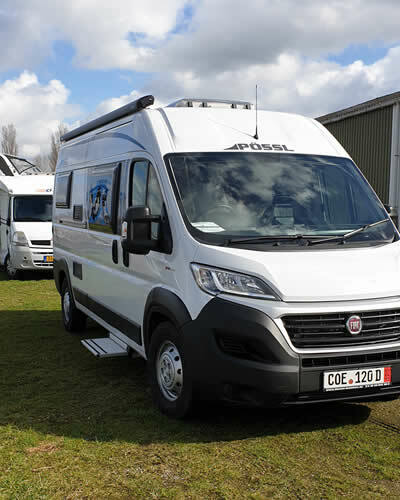 To hire our RUBY Campervan click the links below to contact us.